At PODS we know that size matters, you only want to pay for the space you need so we have developed 2 smaller size vaults at 20 sq feet and 35 sq feet. These can be used in multiples of 1, 2 or more to fit your storage needs. 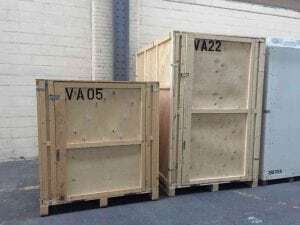 The storage vaults are still delivered to your door but our driver will help you load your items straight into the vaults as they cannot be left with you (like the larger PODS containers can) to load. Instead they stay in the back of our larger vehicle for loading. 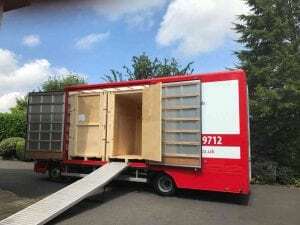 You lock the unit with your own padlock and keep the key and they are then transported to our secure storage facility to store for as long as you need. On the left you can see our smaller PODS vault measuring 5 feet wide x 6.9 feet deep x 5 feet high. We usually recommend this size for de-cluttering to store boxes and small items. To the right is our standard PODS vault measuring 5 feet wide x 6.9 feet deep and 7.3 feet high. This size can hold smaller or 1 or 2 items of larger furniture (utilising the height) along with boxes. Both units can be delivered to your door for loading or you can bring your items direct to our storage centre. Give us a call today to discuss your needs and we can give you a quote for one or two of our vaults depending on the items you need to store. If you need a larger space – see our PODS containers here.